I thought I'd do something a bit different this week so, starting today, I'll be letting the posts flow in a way that follows my creative process (which often seems chaotic!). It's not always easy to pin point the start of a creation, influence or inspirational spark but for me (particularly at this busy cardmaking time of year) I'm very influenced by wanting to use up scraps and leftovers! This is a very simple card that has some elegance. It could be used for a sympathy card but the splash of Pool Party (pardon the pun!) brightens it up enough to make it multipurpose. The base card is Basic Gray. 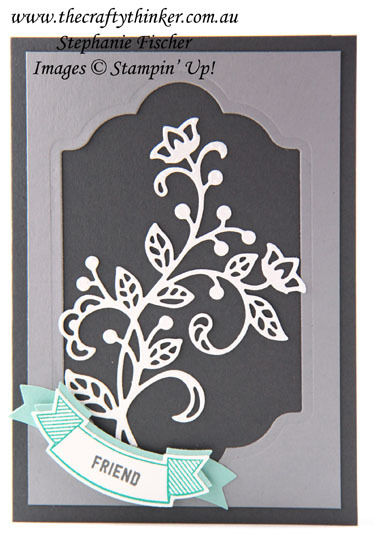 The Smoky Slate layer has the centre cut out with the largest of the Lots of Labels dies and the Flourish is cut from Whisper White cardstock. Using the Thoughtful Banners stamp set, I stamped the banner in Bermuda Bay ink and the word friend with Basic Gray ink. I cut the banner with the coordinating Duet Banner punch and then cut a scrap of Pool Party cardstock with the same punch. I cut the smaller banner in half and adhered each half so that they would show behind the main banner. Tomorrow I'll show you how I used the negative shape from the Flourish die cut and on Wednesday you'll see what happened to the Smoky Slate label.